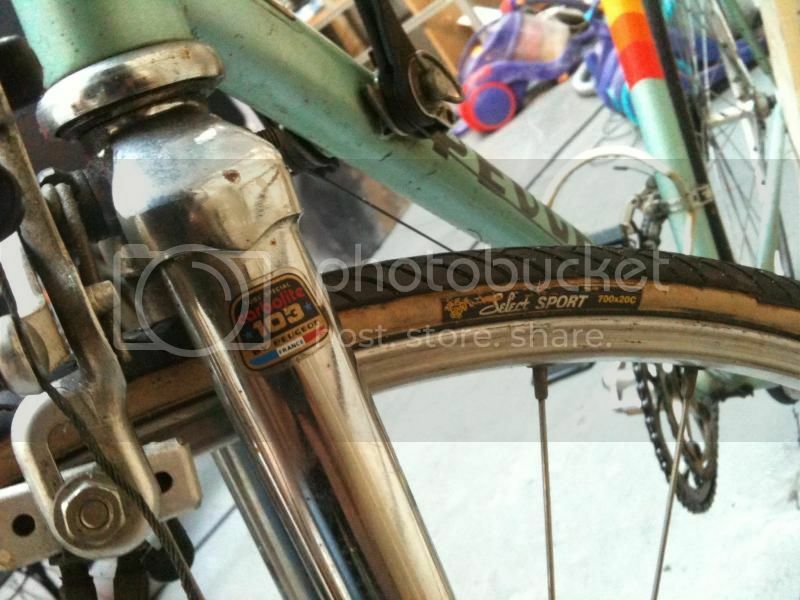 One of my friends has had a Peugeot roadbike tucked away for several years. He bought it and didn't really ride it much so stored it away. I happened to ask him about it about 6 months ago and he said that he'd be interested in selling it as it wasn't being used. We agreed a ball park figure and finally this weekend gone we managed to get together and he brought it round. Comparing this factory fresh example to mine it seems that mine is actually quite original - even down to the tyres I think. I gave it a quick look over last night, adjusted the seat position and dropped the stem a little (as it was extended past the max line) and naively decided to ride it into work this morning without really giving it a proper once over. A mixed bag! Lovely bike to ride, and finally a bike that actually fits me! However about 2/3 of the way to work the rear end started making some nasty clonking clanking noises....worse when pedalling but still present when free-wheeling. Closer inspection shows that the other cone is quite pitted to so I think someone has been tinkering and has either forgotten to fit the locknut or lost it/not realised how important it is. Aside from that she's a lovely old gate.....I know nothing about road bikes, let alone Peugeots from this era so any tips/advise on owning one of these racers is very much appreciated! There's plenty of tweaking and setting up to do (notice the brake block position as an example)! Anyway - it's a train ride home for me tonight.....but I can't wait to get it fixed and get back on it. Deep clean, polish and photoshoot! Last edited by sherlylock on Fri Jul 01, 2016 2:18 pm, edited 7 times in total. Lovely bike, rather like an old peugeot myself. Are you sure its the rear hub and not the free wheel ? Those mailard ones tend to loose their locking ring and then slide about. 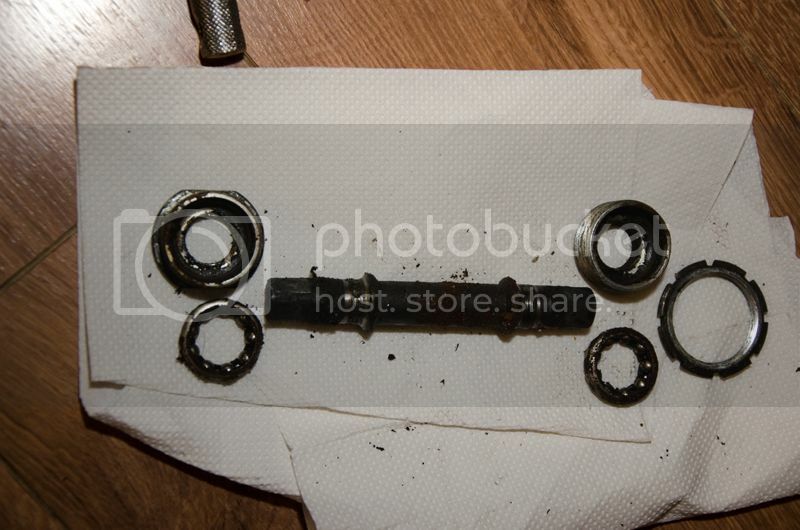 Freewheel looks OK (need a special tool to remove if my research is correct - one with a built in bottle opener?) - it's just missing a lock nut on the drive side. The adjustable cones look a bit poo....they are quite pitted, which means I'll be throwing them away. I've read that the bearings are smaller than most due to the design of the hub and there are no replacements for these cones. I've also seen statements to suggest that the helicomatic freewheel/hub is a great idea on paper but isn't actually that good in reality, and that they're best to be replaced rather than used......which is all very debatable or course! 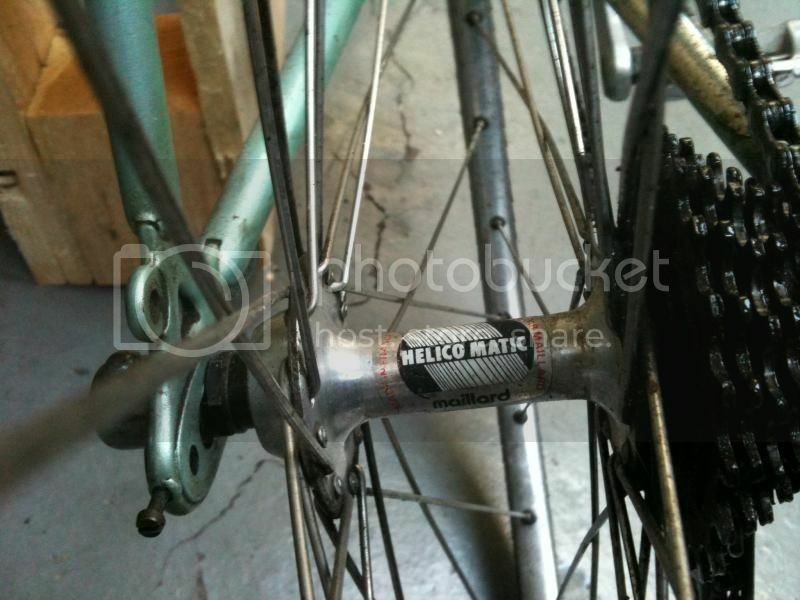 Anyway I've maybe got a replacement on the cards thanks to a friend & retrobike member SIMONFREESE - and if that doesn't workI've got a spare 700c rear Mavic MA2/Shimano 105 wheel which could go on. Pair of Michelin Sport Dynamic Tyres are on order, should arrive tomorrow as are a pair of black hoods (the original brown/gum hoods are missing). How have you all been..hows the lttle one? Nice bike..have not used my road bike in a while! Hi Whayne - little one is cool ta! Think we're settling into a bit of a routine (which I'm sure will change!). Hope you and yours are all keeping well? 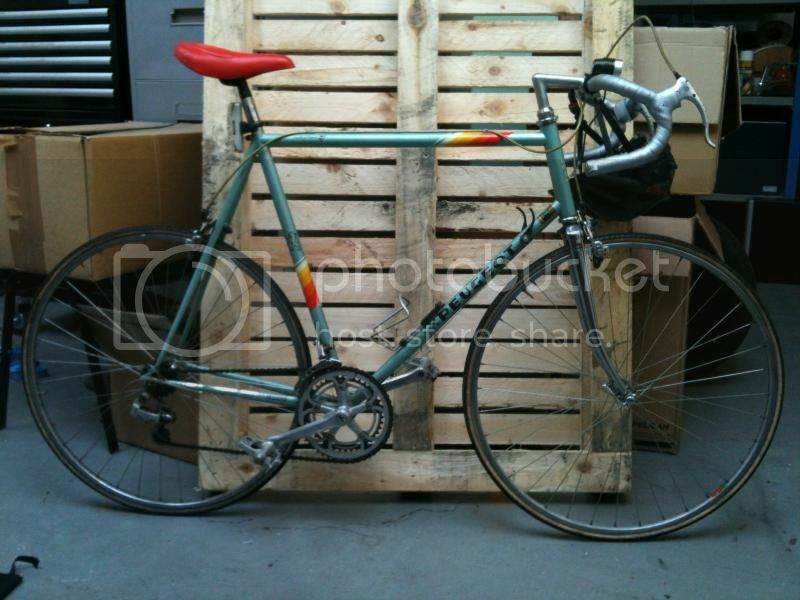 I thought it was about time I invested in a road bike for the commute and obviously it had to be a retrobike! I've been riding it in this week to act as a bit of a shakedown to see which bits fall off/need replacing. I had a dig around in sherly's bike emporium (aka the man cave) last night and robbed a locknut off a spare 700c wheel that I have. 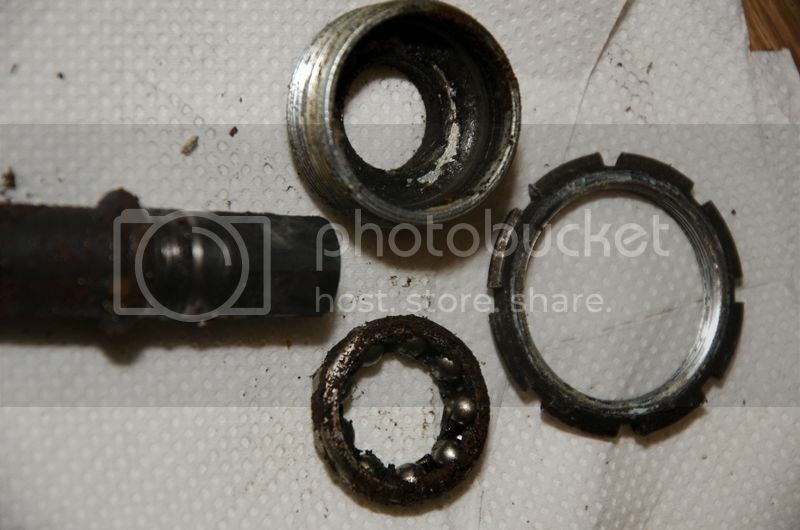 I stripped the hub down, cleaned out the sludge/swarf(! 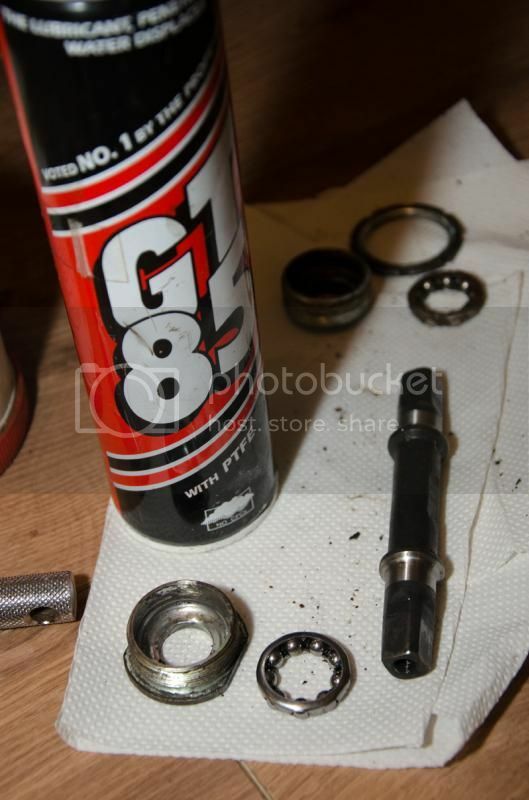 ), flushed out with liberal amounts of GT85 and then reassembled with fresh grease/new locknut. It's borderline graunchy (certainly not buttery smooth) but is usable for the time being. Be interested if you find the wheels as spares - let me know what you want for them or if you need anything as swaps. Swapped the saddle over for a Flite Titanium too while I was there. No tyres as yet today - hopefully tomorrow as the current ones are a little past their best.......and the bottom bracket has a lot of play in it too. This needs investigation - hoping a stripdown, regrease, adjustment will cure. How complete is your PX10? Have you stripped much off it yet? The PX10 is a long way away from being ready. It needs sand blasting, painting, decals, lacquer, and rebuilding. I also need tyres and simplex cable clips plus some cotton tape. Lots to do! Looking forward to joining you on the road with the Pugs I have been looking out for an easier Pug project that I could use in the meantime, something from the 80's. 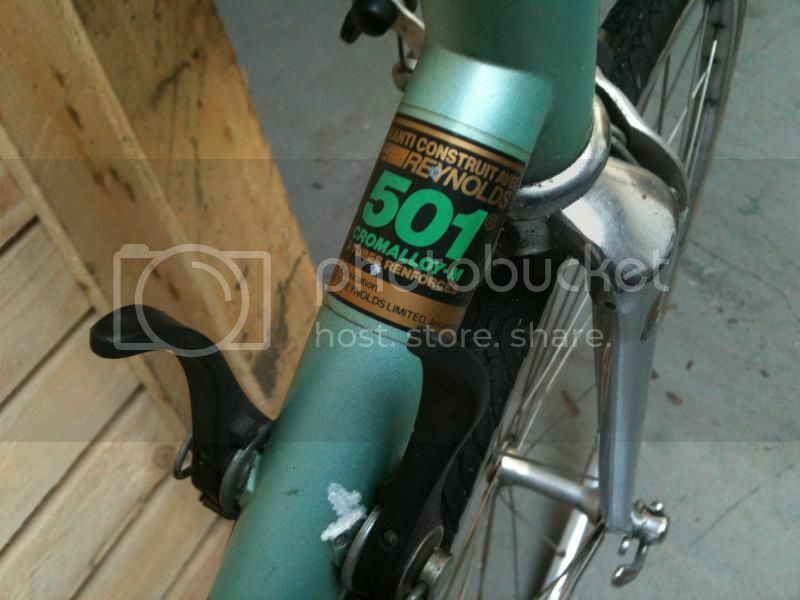 The PX10 will probably only come out on high days and holidays so a second road bike makes sense. Funny how they seem to breed! Funny how one bike isn't enough - looking over this bike I started having thoughts of "maybe I should keep as is and not use it" as it's so original.......but I decided that it needs to be used and enjoyed! 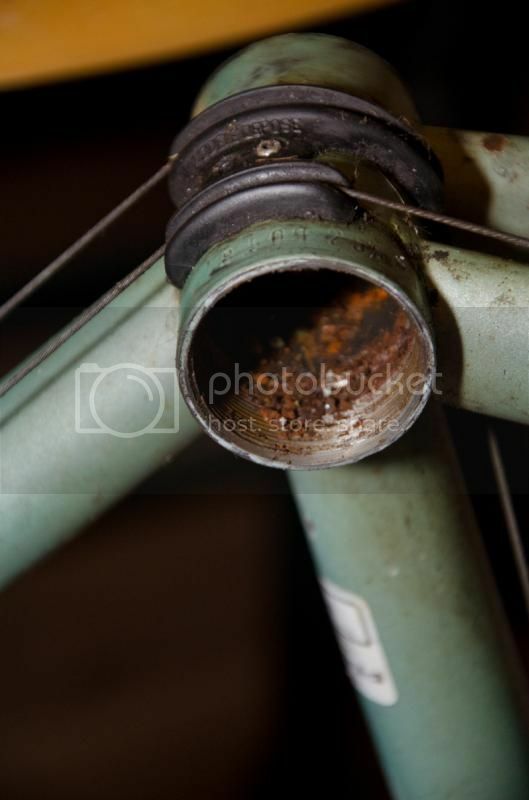 Job done last night - stripped the bottom bracket out, cleaned out the crud/dead grease/rust, re-greased and re-assembled. How smooth should these cup-cone adjustable bottom brackets be? New tyres have turned up too! 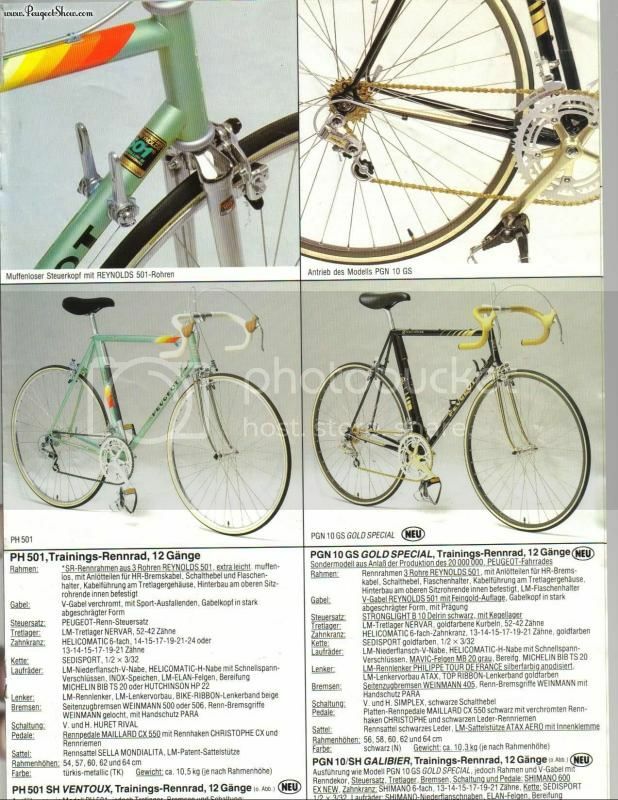 Finally found a catalogue entry for the bike! Albeit in German....looks like it may be a 1986 model. Also looks like it's a continental model - this colour-way and spec only seems to be in the German catalogue.